Browse our collection of blue sofas. All our blue sofas are handmade in Britain and available in an extensive range of house and luxury designer fabrics. It could be shades of Blue, Navy, Azure or Royal Blue that appeal to you, a classic blue sofa is always a great decision for elegant and sophisticated interiors. Imagine your home with a beautifully crafted chesterfield sofa packed full of imagination, elegance and style or perhaps a perfectly practical Royal Blue sofa bed for when distant friends pop over. 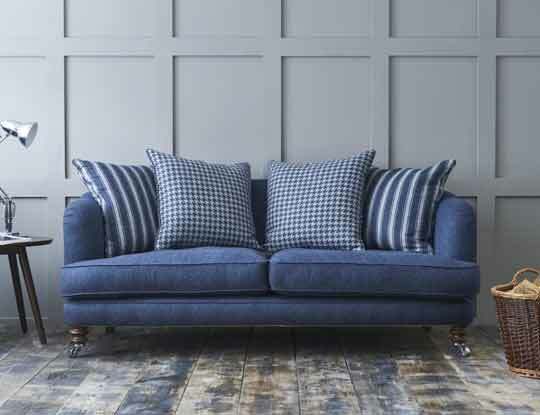 Classic Blue corner sofas are made for the whole family or perhaps a Blue armchair in Navy Blue tones if you want to go the whole hog. If you are looking for contemporary sofas or perhaps a more traditional sofa, there so many shades of blue sofas to choose from and something to suit all room designs. 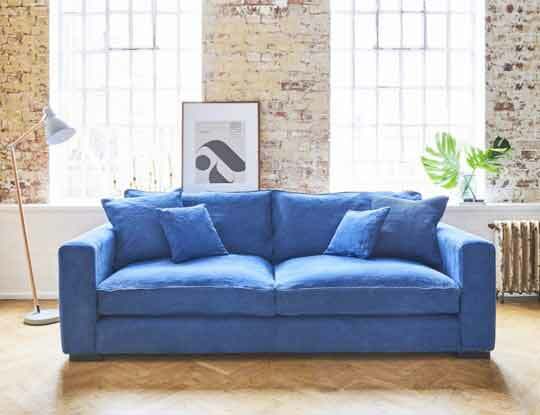 Any of our Handmade, British sofas can be covered in your favourite blue fabric and with quality expert advice available in not only in our showrooms but online too you are sure to find exactly what you’re looking for. Our speciality is creating the perfect couch, bed or chair for your needs. Our handmade British sofa collection is made right here in the UK, in fact, down the road in Nottingham in our very own sofa workshop. Blue sofas are bang on trend right now. Our design consultants are seeing a real shift in the colours of choice we sell; from greys and beige, to blue fabric sofa. S&S have a huge choice of Blue fabrics to create your comfy couch in. All our stores have dedicated fabric rooms where you can loose yourself in everything from a pale blue deisnger linen chair, to a navy velvet corner unit. With so much choice we can see why people get a little confused. That is why in every showroom, we have interior design consultants ready and waiting to answer your every question and guide you through the latest trends and fashions so you can create something special. So why not pop in store now and see what kind of azure sofas you can uncover. Why not order some free red fabric samples pack, so you can see the high quality fabrics we offer.